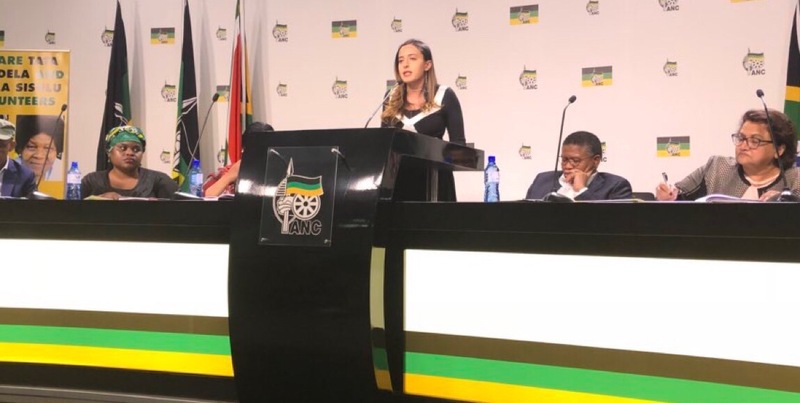 South Africa mourned the loss of many icons this week with the memorial of Mamâ€™ Winnie Madikizela-Mandela and the commemoration of Chris Haniâ€™s death amongst others. But there is one reason we can celebrate this week: Gogo Esther Mahlangu. The celebrated Ndebele artist was awarded an honorary doctorate, and this is just one achievement of Mamâ€™ Estherâ€™s to add on to a very long list. 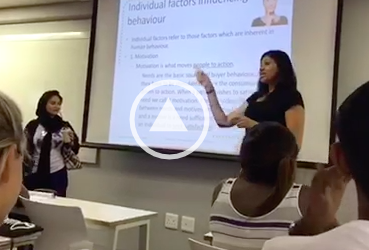 SHAAZIA EBRAHIM and FATIMA MOOSA round up the many achievements that make Esther Mahlangu a South African icon. 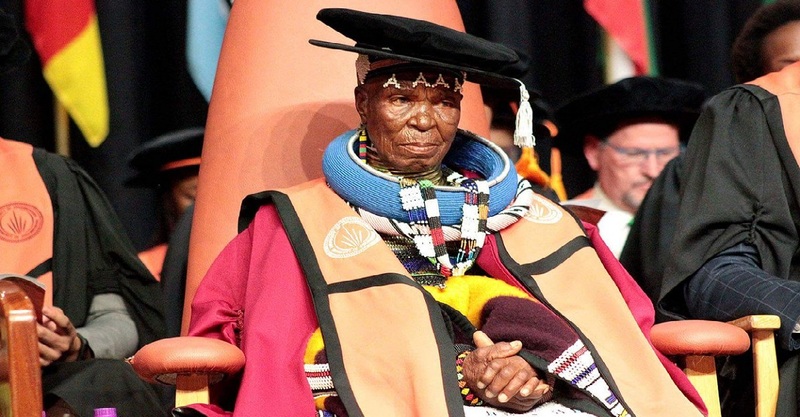 On Monday evening, Gogo Esther Mahlangu was awarded an honorary doctorate by the University of Johannesburg (UJ) for her contribution to the arts. The executive dean of the Faculty of Art, Design and Architecture, Professor Federico Freschi, said Gogo Esther was awared the doctorate in recognition of her legacy as a cultural entrepreneur, and being able to skilfully negotiate local and global worlds as well as being an educator. Mahlangu said when she began painting her murals at the age of 10, she never would have expected that she would get to travel the world just by doing what she loves. Gogo Mahlangu was accompanied to her graduation ceremony by members of her community, wearing her traditional Ndebele attire. Speaking to Aubrey Masango on 702, Masango asked Gogo Esther if she is she was now a doctor that heals people and she said yes she is. Gogo Esther said she heals people in the Ndebele way. The interview was conducted in Ndebele with Masango translating for the listeners. Mahlangu was born in 1935 on a farm in Mpumalanga as Esther Nikwambi. As a child, Mahlangu learned traditional Ndebele wall painting and beadwork. She became an expert in mural painting as a teenager making use of the widening range of paint colours that surfaced in the 1940s. Speaking to Masango, Gogo Esther said she has been quite naughty as a child when she started learning the painting, and had often gotten it wrong at first. However, she kept at it until her mother and grandmother realised she was quite talented. Her international career took off in 1986 when Parisian researchers who were travelling the world to document traditional arts saw the paintings on Mahlanguâ€™s house. Impressed by her talents, they invited Mahlangu to create murals for an exhibition of international contemporary art called the Magiciens de la Terre (Magicians of the World). Mahlangu was the first to transfer the traditional Ndebele style of mural painting to canvas. But thatâ€™s not her only first. She was the first non-Western person and woman to design BMWâ€™s art cars. The celebrated Ndebele was the 12th artist to join the ranks with artists like Andy Warhol, Roy Lichtenstein, and Frank Stella in 1991 to design BMWâ€™s art cars. 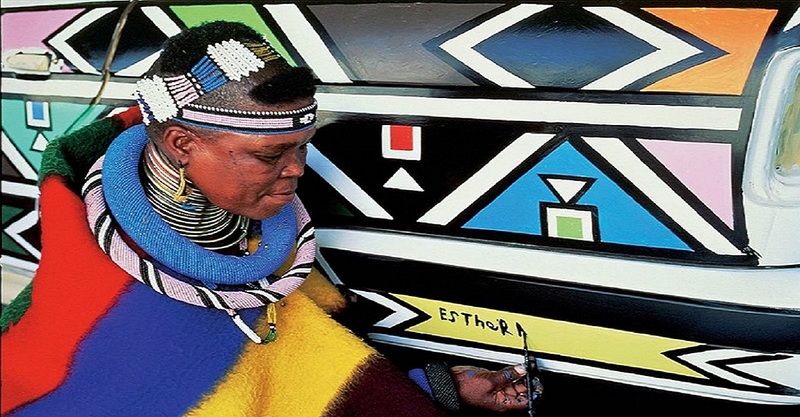 Mahlangu painted her signature style of Ndebele motifs on a BMW 525i – what was known as the first â€œAfrican Art Carâ€. Gogo Esther won the arts and culture veteran award at the 2017 Ubuntu Awards. She was nominated in the same category as the legendary singer Johnny Clegg. Clegg received just over 500 votes, while Mahlangu got over a thousand votes! In her speech when she received the award, Mahlangu said: “I am delighted and appreciate being regarded as a veteran of arts and culture for my country and representing my province.” But this is just one of the many awards that Mahlangu won. Her awards include the silver class of South African governmentâ€™s Order of Ikhamanga in 2006, the Mpumalanga Arts and Culture Award, two awards from Radio Ndebele, and an award from the French Ministry of Culture. Last year, Gogo Esther teamed up with Grammy award winning artist John Legend and vodka company Belvedere Red to help fight HIV/Aids in the African continent. Mahlanguâ€™s Ndebele design was etched onto the limited edition Belvedere bottles marked with the (Red) logo. This was part of the #MakeADifference campaign and 50% of the proceeds from the sale of those bottles go towards fighting Aids. All over the world, people have been recognising the greatness that is Esther Mahlangu. Last year American muralist Iman Shaklin Roberts painted a giant Ndebele-inspired mural across a two-lane road in Tribeca, New York in her honour. Mahlanguâ€™s work has been featured in collections all over the world including in South Africa, the United States, Japan, Germany, and France.